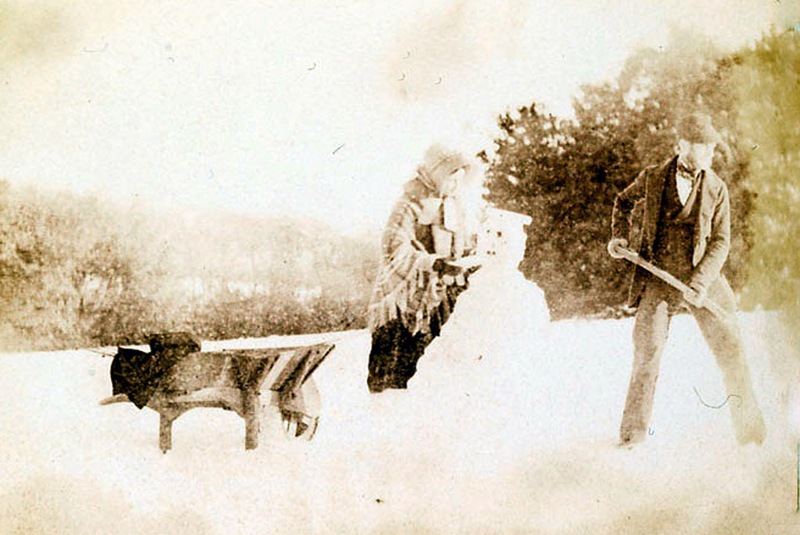 Did you know that the earliest known photograph of a snowman was taken in Swansea? The first documented man (or woman) to be made from snow dates back to medieval times, with the Book of Hours from 1380 believed to be the first time one of our frosty friends were referred to in print. But it wasn’t until 1853/54 that the first image of a man carefully assembled from mounds of snow and a few carefully placed lumps of coal was preserved for prosperity right here in South West Wales. The photo above was taken by Mary Dillwyn of Penlle’r-gaer, said to be the earliest female photographer in Wales, and an early pioneer photography with her brother John Dillwyn Llewelyn. As you can see from the photograph, snowmen were less decorative in appearance back in the mid 19th century – no arms or legs, and without a carrot for a nose, a pipe to smoke, or a scarf to keep them warm. Here’s a snowy Swansea scene from Dylan’s youth, reminiscent of his wonderful recollections in A Child’s Christmas in Wales. The photo, which was a postcard of the time, appears to have been taken facing up Bryn Road in Brynmill, just a short hop from the poet’s home in Cwmdonkin Drive.